In this three part video series, IDology CEO John Dancu discusses some of the factors that are shaping identity verification and authentication today. 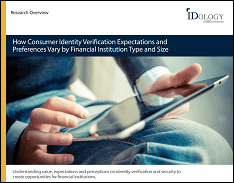 These brief and informative videos provide a candid look into the future of identity verification, new verification methods and how organizations can leverage them to not only stop fraud but improve customer experience. In this video segment, IDology CEO John Dancu discusses digital personas, synthetic identities, biometrics, and the importance of mobile device verification.